Some messages are irresistable - such as "Chalkboard writer wanted" outside the Waggon and Horses in Milton at the end of last year. But I resisted! Then the milton-chat e-mail came around with "Chalkboard writer wanted, would suit student". So I went to visit the Waggon and Horses for a chat and get to know David and Louise, the new publicans. A fortnight later, no students had volunteered and I found myself amongst the bustle of a pub in full redecoration and renovation by not only Louise, David and Batty, but by their family and friends. I was about to tackle my first chalkboard. 1. They were (and still are) a friendly bunch. 2. The challenge of a new art form and 3. I like the thought of ephemeral art. You create something with a limited lifetime. Chalkboards are done with chalk pens which are like giant felt tips. The chalk colour is either waterproof or at least water resistant to rain. This means that you are working on something that will look quite rough close up as you cannot do very fine detail. However, that is not a problem - you want to create an impact at a distance. Half the work is sorting out your layout and lettering. The message has to be as minimal as possible, so the writing does not get too small to read. If possible create additional features that also give the message, perhaps as a picture or decoration. I had naively thought that a board would take about an hour to do. For me as a novice with the medium, it takes longer! Apart from the pleasure of making a new Chalkboard, the thing that I really learnt was an appreciation of other chalkboard artists. Next time you are out and about, look out for the chalkboards outside the pubs and restaurants. You will find three distinct groups. 1. Do it yourself by the owner. 2. Commercially made, over-precise signs and 3. Work by artists who may have traveled halfway across the country to spend a day or half a day at a venue to create signs to order, on site or back in their own workshops. 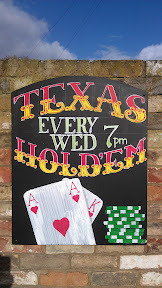 Chalkboard signs have to grab your attention, albeit fleetingly, generate thirst or hunger. Signs make you subconsciously decide - this is a place to stop. They give an impression of the quality and type of an establishment. When you look closer, you then see how a good chalkboard artist cleverly uses colour, bold strokes, shading and blending to create the unique and yet ephemeral images and writing. Chalkboard art is a successful commercial art form that survives in a highly digitised and graphically precise and visually educated world. Each writer or artist will have their signature strokes and designs. And the work will last until the next offer, season, change of menu or beer hosted at a pub.